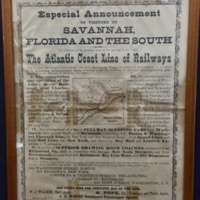 An announcement from the Atlantic Coast Line of Railways dating back to December 29, 1877. At the time, the Atlantic Coast Line was an informal name that was adopted in 1871 by railroads paralleling the Atlantic Ocean. The flier advertised a new luxurious tourist train that eventually became considered the first deluxe tourist train in the United States. Speaking specifically to Northerners, this flier offers five different railroad lines to the South, while also offering different kinds of boxcars. The first offer is the completion of the Ashley River Railroad. The second offer is a double daily service to Charleston, South Carolina, and Savannah, Georgia. The third is a semi-weekly service of sleeping cars between Boston, Massachusetts, and Savannah. Additionally, the fourth offer is also for sleeping cars from Washington, D.C., to Savannah, and connecting with Boston and Washington. Finally, the fifth offer is from Richmond, Virginia, to New York City, New York. The flier then offers the location of the company’s headquarters in Boston, New York, Philadelphia, Baltimore, and Washington. Lastly, the flier lists the names of agents for southern travel: W. J. Walker, General Agent; A. Pope, General Passenger and Ticket Agent; and J. H. White, Passenger Agent. The flier itself was printed by Munroe and Metz. Original advertisement, December 29, 1877: Museum of Seminole County History, Sanford, Florida. Digital reproduction of original advertisement, December 29, 1877. 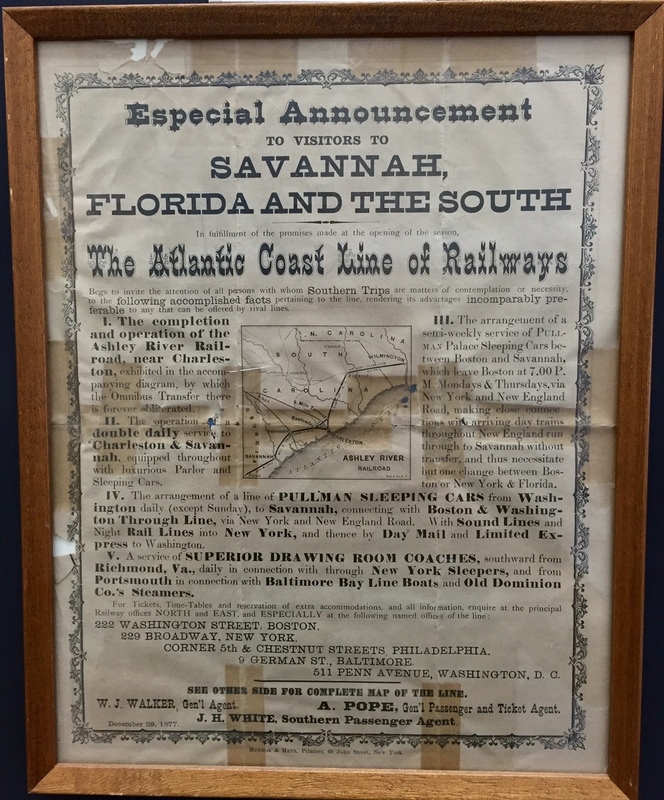 Atlantic Coast Line of Railways Ticket Office, Washington, D.C.
“Especial Announcement to Visitors to Savannah, Florida and the South.” RICHES of Central Florida accessed April 19, 2019, https://richesmi.cah.ucf.edu/omeka/items/show/6434.